Custom Coffee Wraps Personalized in Bulk. Insulated, Promotional, Inexpensive. Best price in America. 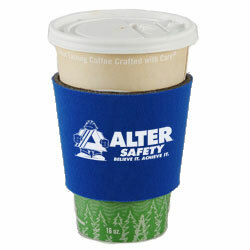 High quality, yet inexpensive promotional Insulated Coffee Wrap in bulk, custom imprinted. We also supply blank (not personalized) bulk Insulated Coffee Wrap for $0.75 each. Free artwork design and Free proofs! American clients pay no taxes. The unit prices below include your 1-color custom imprint on one side. Add the amount shown for each additional imprint color. We also supply blank (not custom imprinted) bulk Insulated Coffee Wrap for $0.75 each. Setup Charge: $50.00 per imprint color; $15.00 on re-orders. Exact PMS color match: $50.00 (there is no charge if you use our standard colors: see our standard colors below). Production Time: 7 days; Rush Production of 3 days: add $0.35 per unit. Blank (not custom imprinted items ship next day). Introducing our Insulated Coffee Wrap keeps your morning coffee warm and protects your hands from scalding heat. Fits most disposable paper and styrofoam cups. Color: Black, Blue, Burgundy, Green, Lime Green, Navy Blue, Orange, Red, Violet & Yellow. Product Size: 2-7/8"H x Inside diameter 4-1/2" tapers to 2-3/4"
PRODUCTION TIME: 7 days after art approval; Rush 3 day production is available: add $0.35 per item. Blank items ship next day.